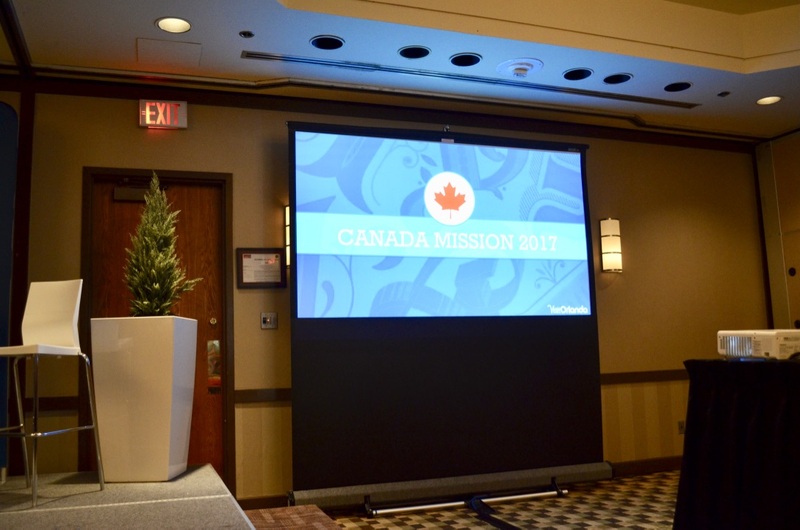 Visit Orlando kicked off its Canada Mission with a visit to Calgary to update us all on new things happening in Orlando! Representatives from theme parks including SeaWorld Parks & Entertainment, Walt Disney World, Universal Orlando Resort were present to let us know what is new and what to expect in the parks soon. With iconic theme parks all in the top 10 theme parks of the world, Orlando is the perfect canvas to create amazing memories year after year, for families of all ages and sizes. SeaWorld has five theme parks in the Orlando area – Aquatica, SeaWorld, Discovery Cove, Busch Gardens and Adventure Island – and is focusing on “Experiences that Matter”. They want guests to connect, care and celebrate the animals at SeaWorld, with entertainment and attractions that will inspire guests to act, with educational focuses on what guests can do to help the animals when they go home. SeaWorld continues its commitment to animal care and rescue, rescuing over 31,000 animals with the aim to rescue, rehabilitate and release into the wild. All rescue efforts are fully funded by tickets sales, so your admission into the parks helps support SeaWorld’s commitment to animal care and rescue. The Canadian Resident Offer is available for single day tickets sales and 2 day admission tickets, saving 25% off ticket prices. Other vacation packages including Eat Free Packages and Kids Free Packages are also available to ensure additional savings when you build a vacation package and spend several days at Sea World. With three theme parks (Universal Studios Florida, Islands of Adventure and Volcano Bay), Universal Orlando Resort has become a destination in itself with a minimum of three days required to fully enjoy the parks. Universal Studios is known for epic vacations with cutting edge technology to stimulate your senses. It is a vacation that you enjoy WITH your kids, not THROUGH your kids, perfect for multi-generational families. As the kids grow up, so do the theme parks. With additional onsite resorts continuing to open, including the new Aventura Hotel opening next year, more than 6200 rooms will be available to Universal onsite guests. The newest water park, Volcano Bay provides a day for guests to enjoy the rides with a their new virtual line technology using TapuTapu bands. Guests can reserve a place in line for the attractions, with a guaranteed time to return, but enjoy other areas of the watermark while they wait for their spot in line. Onsite guests also receive length of stay discounts so the longer you stay, the more you can save (up to 35% on a 7 night stay or longer). Right now, there is a current promotion available for purchase until November 30, 2017. Purchase a 3-Park 2-Day Park-to-Park ticket and get 2 days free! Ticket are valid for use until May 17, 2018 with NO BLACK OUT dates! Tickets must be fully used by May 17, 2018 as all tickets expire in full by this date. Pandora, the World of Avatar recently opened in Disney’s Animal Kingdom Park with two signature attractions for guests to experience an out of this world experience on Pandora. Flight of Passage allows guests to board a banshee by linking up to an avatar in flight to experience the rite of passage for the Na’vi people. The Na’vi River Journey provides guests with a slow moving boat ride enjoying the bioluminescent forest and watching the animals move with you towards the calming Shaman of Songs. New attractions we can expect at Epcot include the Ratatouille ride, currently at Disneyland Paris, being added to the France Pavillion and a Guardians of the Galaxy attraction, replacing Ellen’s Universe of Energy. Two new lands are being built in Disney’s Hollywood Studios. Toy Story Land opening in 2018 will shrink guests into the size of a toy, with the aim of experiencing Andy’s backyard from the perspective of a toy. Star Wars Galaxy’s Edge is expected to open in 2019 as a remote trading port in the Galaxy, and experiencing the battle between the Resistance and the First Order. There is so much happening in Orlando it’s hard to keep up! That’s what I do so that I can advise you when you’re ready to book your Orlando vacation. Let me know when you’re ready to plan your Orlando vacation and we can help you with all the details to make it amazing! Start your Disney planning here!